If you feel a little bit stressed when thinking about how to pay for college, you’re not alone. Luckily, there are many programs available to Massachusetts residents to make the process easier, and we’re going to walk you through all of your options. Are you ready to start planning for your future? Then let’s talk about the four steps all Massachusetts residents should take in order to fund their college education. The FAFSA form is something you will soon become very familiar with. FAFSA stands for Free Application for Federal Student Aid. This is a form you’ll have to fill out in order to receive federal funding. Although the FAFSA might not be too much fun to fill out, it’s a very important part of the financial aid process. Just by filling it out, you will automatically be qualified for some forms of aid such as federal grants, federal subsidized and unsubsidized loans, and some state grants. If you find yourself having questions while filling out the FAFSA, feel free to check out our step-by-step guide that will walk you through the entire process. It’s important to keep in mind that some grants have application deadlines that you don’t want to miss. The sooner you fill out your FAFSA, the better. You can even apply before you know when school you’ll be attending. Just remember that the FAFSA should be the first step on your financial aid checklist. As we mentioned in step one, just by filling out the FAFSA, you will automatically be qualified for some forms of state funding, but not all. That’s why it’s wise to check out other state offerings on your own. To begin your search on state funding, you may want to browse the Massachusetts Department of Higher Education website. There, you can find a quick guide about the Massachusetts financial aid programs, as well as other useful information about how to fund your education. Foster Child Grant provides up to $6,000 assistance per year to students who were in the foster care system. MASSGrant for students who have an Expected Family Contribution (EFC) between $0 and $5198. Your EFC is a number you will receive from filling out your FAFSA. Gilbert Matching Student Grant Program for Massachusetts residents who demonstrate financial need. Cash Grant Program is a complementary program to the Need-Based Tuition Waiver Program, and it provides grant money to cover additional charges, such as mandatory fees and non-state-supported tuition. Part-Time Grant Program for students taking classes part-time. Public Service Grant Program for students who experienced the loss of a parent and/or spouse who was killed or missing in the line of public service duty. Paraprofessional Teacher Preparation Grant Program for Massachusetts residents who are currently employed as paraprofessionals in Massachusetts public schools, but who wish to become certified as full time teachers. Along with grants, Massachusetts also has a number of scholarships available to residents. Agnes M. Lindsay Scholarship Program is available to students from rural areas of Massachusetts who attend a public college in Massachusetts. Christian A. Herter Memorial Scholarship Program for students who have overcome major adversity in their lives (i.e., physical or mental abuse, catastrophic illness, etc). Obstacles may be mental, physical, geographic, or societal. Early Childhood Educators Scholarship Program to provide financial assistance for currently employed early childhood educators and providers who enroll in an associate's, bachelor's or master's degree program in early childhood education or related programs. Massachusetts High Demand Scholarship Program was created to encourage the completion of degrees in STEM (science, technology, engineering, math) in Massachusetts. John and Abigail Adams Scholarship is a merit-based program which is awarded based on scores ot the 10th grade Massachusetts Comprehensive Assessment System (MCAS) test. One Family Scholarship Program is available to heads of households who are at risk of homelessness to help them complete a degree or program. This scholarship is intended to help provide a permanent path out of poverty. Paul Tsongas Scholarship is a merit-based program that provides assistance to students with a GPA of 3.75 and SAT scores of at least 1200 (or the ACT equivalent). For more information about Massachusetts grants and scholarships, visit the Massachusetts Department of Higher Education website. If you’re a high school student, it’s wise to regularly check in with your guidance counselor for updates on local scholarships. Guidance counselors can be great resources during the college application and financial aid process. It’s also a smart idea to do your own searches online. There are lots of different scholarships available, you just have to do some digging to find them. You can search for scholarships online by major, geographic area, hobbies, extra-curricular activities, or any other characteristic. Many colleges in Massachusetts also offer scholarships, so be sure to check out their websites or call their financial aid offices for more information. For example, you can visit this page to search through a catalog of scholarships available to students attending the University of Massachusetts Amherst. CollegeScholarships.com is a great resource for local scholarships. You can visit the site to view a variety of Massachusetts scholarships, including scholarships for certain counties. For example, Hampden County has 10 scholarships available just for county residents. For a complete list of scholarships by county, visit the link above and scroll to the bottom. Another useful tool for scholarship hunting is Sallie Mae's Scholarship Search. This is a vast scholarship database that is constantly being updated with new awards. You can also check out Big Future by College Board. This site offers a variety of aid from over 2,200 different programs. Plus, if you find yourself stuck on what major you want to pursue, Big Future can help you explore different options. If you’ve gone through all of your options between grants, scholarships, and federal loans, a private loan might be able to bridge the gap in your college funding plan. Before taking out any Massachusetts private loans, check out our free NitroScore tool. 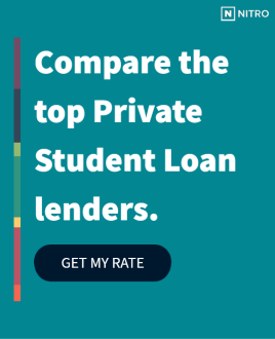 If you’re on the fence about a private student loan, the NitroScore tool can help you decide if a private loan is the right move for you. Simply enter a college and major combination, and the tool will tell you your total costs of education. It will also give you a projected salary after graduation, and tell you how much of that salary per month will go towards paying off your student loans. From there, you will receive a score that will tell you how easy or difficult it may be to pay off your student loans. You can customize the results with different factors such as scholarships and other savings. You can also compare different college and major combinations. After familiarizing yourself with the NitroScore tool, you can find out which of our trusted loan partners can give you the best rate. A college education is an attainable goal for Massachusetts residents, thanks to all of the resources available. You can’t start the process too soon, so start planning for your future today.